Originally from Europe, Petr graduated from a top Cross Country Ski Gymnasium in the Czech Republic, and later earned two Master’s degrees: one in Education and one in Sport Science and Coaching. He started his coaching career both as a teacher and coach of gifted young athletes. Simultaneously he worked with visually impaired athletes and led them to the Paralympic Games 2002. 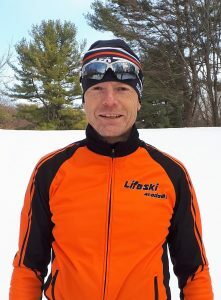 When Petr and his wife Kate immigrated to North America he carried on his coaching journey while working with junior, senior and master athletes through several clubs and ski communities across USA and Canada. Starting in Utah, next he was growing new generations of cross country skiers from the north to the south of British Columbia, from the east to the west of Ontario, developing racing programs at the University of Maine at Presque Isle in the US, or miraculously fostering Jan, the Irish-Canadian, from recreational skier to 2014 Olympian. Not being busy enough, he kept returning for a few summers to Australia to help build a youth cross country ski program in New South Wales. These days, depending on his busy schedule, you can see Petr share his time between raising his daughter Anna, coaching his new ski club, teaching public to ski, running his massage therapy business, or just riding a bike, running, roller skiing, kick biking, swimming…or, of course, chasing snowflakes on his favorite skinny skis. While having the highest coaching license in Europe, he is an NCCP level 3 coach as well as a CANSI level 1 instructor in Canada. In 2017 he obtained diploma in massage therapy and became Registered Massage Therapist. Katerina is passionate about cross country skiing and loves sharing her enthusiasm for the sport. She wants athletes to develop self-confidence and skills such as commitment, patience, and pursuit of excellence in skiing that will help them achieve in other aspects of their lives. Katerina has a Master’s degree in Special and Physical Education, and diploma in Physiotherapy. Katerina has been coaching cross country skiing over 25 years. She has national and international experience. She coached and taught at cross country ski public school in Europe. She was a ski guide of visually impaired athletes and supported cross country ski athletes at the Paralympic games in Salt Lake City. She coached with XC ski clubs in Canada (BC, ON) and Australia. 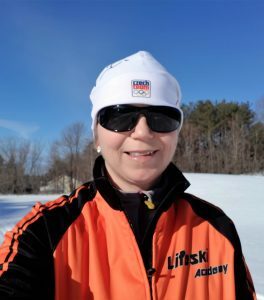 Before she became Lifeski Academy coach, for the last four years she led successfully as Head Coach of the Arrowhead Nordic Ski Club developmental program. Her coaching status is Level B in Europe and CCI-L2T in Canada.